CalSERVES programs provide opportunities for participants to discover passions, realize potential, and express their power. This takes the form of several local and statewide AmeriCorps programs that engage the community in services to support children and families in need. CalSERVES, a program of Napa County Office of Education’s Community Programs, grew out of the belief that all children deserve to thrive academically, physically and emotionally. Starting as a small tutoring program in 1998, we have grown to encompass both statewide and regional initiatives in the areas of after school tutoring and volunteer infrastructure development. Our programs are designed to meet the needs of California’s children, families and communities facing the complex challenges associated with poverty. Central to our work are the 250 AmeriCorps members who serve with us each year, giving wholeheartedly of themselves with passion, energy and skill. 2500 AmeriCorps members have served with us, many of whom continue their service through careers in teaching, social work and further volunteerism. We believe in the power of ordinary people who want to make a difference, whether as AmeriCorps members or as one of the many volunteers who support our efforts with their time and enthusiasm each year. CalSERVES provides opportunities for participants to discover passions, realize potential, and express power. Passion, Potential, Power. CalSERVES engages staff and AmeriCorps members in service opportunities to strengthen communities throughout California. 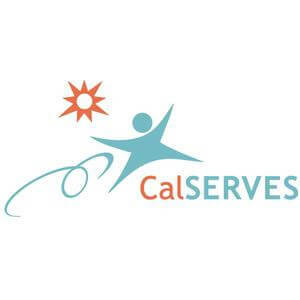 CalSERVES provides specialized small group tutoring, implements after school programs, builds volunteer capacity in underserved communities, and develops future leaders. The goal of the program is to provide comprehensive support to students who aren’t working at grade level by leading to improved performance and academic success. The program applies a layered approach implemented by the CalSERVES Mentors for K – 8 students. All students at the school site benefit from the support of organized collaborative games and conflict resolution during recess/break and lunch. Students in need of additional supports will be assessed and assigned targeted tutoring services. Additionally, some students will receive intensive mentoring services. The assessment process will look holistically at each student using a project-developed screening tool, which encompasses academic test scores, behavior data and input from teachers and parents. Through the Volunteer Infrastructure Project (VIP), teams of AmeriCorps members are placed in communities to provide infrastructure support for volunteer programs in service organizations across California. They are building the systems necessary for organizations to have volunteer programs for years to come, ensuring that services can continue to those most in-need. VIP Fellows work “behind the scenes” of service, allowing volunteers to take part in necessary programs, and ensuring that the community’s needs are met. Each of VIP Fellows will work to build quality, sustainable volunteer management systems at Partner Sites.